I am still trying very hard to get back into normal routine, seems like everything is in a rush and I desperately need to resume my time management. I made a quick bento today and since I don't have a small apple cutter, I used my small pumpkin cutter as a substitute. I wonder if N will notice the difference. Yeah, I think the pumpkin cutter is a good disguise,hehehe. 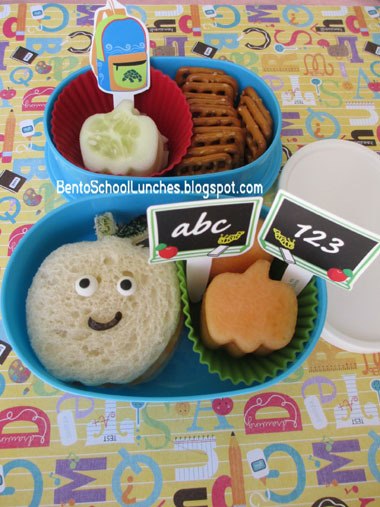 This is the cutest Apple Bento ever! The little expression on the apple is precious!! I am right with you on needing the routine to stay on track...I have to learn to live by one or I'm a train wreck! If it's not too way off topic I'd love for you to share what your routine is like and how you fit in your bento making time! I can tell you've learned the best way to go!